If you’re a serious professional, and educated single looking for a like-minded partner, EliteSingles is for you. The best part is, you can sign up for free and experience everything the site has to offer without paying a penny. If you like what you see, become a member with some competitive pricing plans. EliteSingles offers a free basic membership either on desktop or mobile phone, so if you want to sign up and take a whirl around the site you don’t need to pay. You can sign up, build a profile, upload photos, complete the personality test and even receive partner suggestions, all for free and with no looming expiration date. In addition, you can send smiles and likes to any potential match. This introduction membership will give you a great sense of the site, and what it can do for you. If however, you want to take full advantage the site, and start communicating with other members, you’ll need to upgrade to a premium membership. If you’re a serious professional and fed up with the casual dating scene, EliteSingles is perfect for you. The majority of members have academic degrees and careers, and that could save you a lot of time filtering your search on other sites. EliteSingles is open to any sexual preference (straight and gay members both welcome), any age, and location. If you enjoy your free membership subscription and want to get access to the full site, we recommend you upgrade to the premium membership. The premium membership includes unlimited site communication, and allows the viewing of all profile photos on member profiles. Signing up for a full 12 month membership will work out the cheapest at $33.95/month. EliteSingles accepts many forms of payment including credit card and Paypal. It’s important to note that payments will be taken in one lump sum, so if you choose the 12 month subscription option, the full 12 months will be charged. Similar to other dating sites, if you’ve paid for the premium subscription the site will automatically renew the subscription at the end of the term. If you want to cancel your subscription you can always disable the automatic renewal option under the membership section of your account. When you upgrade to a Premium subscription with EliteSingles, you’ll get access to features that will enhance your online dating experience. An upgraded membership will show you the profile photos of every match you receive (which would otherwise be blurred). If there’s a user you like the look of you can go ahead and write them an intro message. The premium subscription also gives you unlimited access to features like the 'Get Acquainted' tool, which allows you to choose 5 multiple choice questions to send to another member. In response, you'll receive the five questions they're most interested in hearing your answers to. This is a great way to break the ice and get chatting with people. 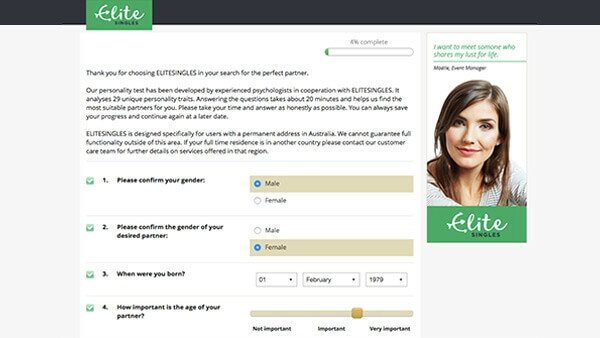 EliteSingles uses what they call ‘intelligent matchmaking’ to find you find you truly compatible matches. This includes a research-based, scientific matchmaking process in which an extensive personality test is used. The more truthfully you fill out the questionnaire, the more accurate the matches. This personality test is based on the ‘Five Factor Model Theory’ of personality traits, which identifies five distinct personality traits: conscientiousness, agreeableness, openness, extraversion and introversion. The test can take up to 45 minutes to complete but it's known for its successful outcome and well worth investing in. EliteSingles stands out from other dating sites in its ability to attract millions of educated professionals worldwide. Because it's so data-driven and takes matching personalities seriously, EliteSingles suggests rich and comprehensive profiles of people just like you, looking for love.